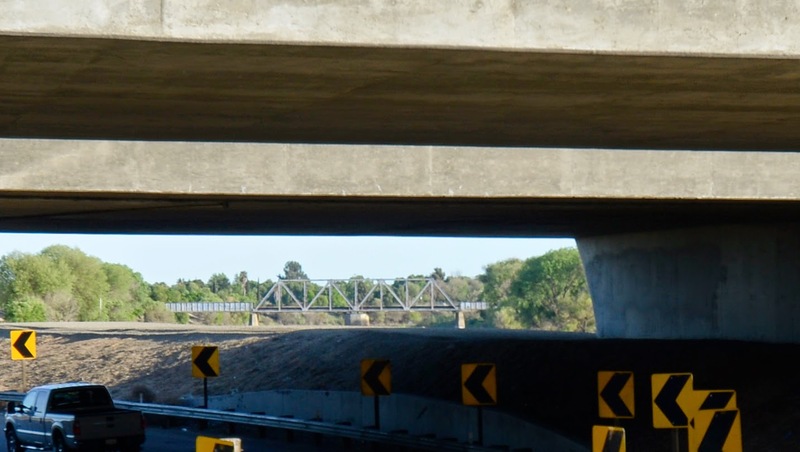 On the south (left) side of yesterday's SR-120 Connector Bridge are the I-5 Bridges (29 0252L/R) across the San Joaquin River. They are 5-span, cast-in-place, continuous concrete box girder bridges on tapered pier walls. These bridges were built in 1971 and improved in 2008. Looking below the soffit of these bridges we can see the UP - Mossdale Bridge East across the San Joaquin River. It is composed of steel through girder side spans and a Warren truss swing span (which is now fixed). This bridge is half a mile south of the UPRR lift bridge, but it was built earlier (in 1928). It's 357 ft long with a 201 ft long main span. San Joaquin County, California Bridges: San Joaquin River Bridges by Mark Yashinsky is licensed under a Creative Commons Attribution-NonCommercial-NoDerivatives 4.0 International License.